Brief update: Other than a brief 24-hour fever (up to 103.5) this past Thursday, I have been fever-free for nearly two full weeks. Further, there have been no fevers since stopping the antibiotics last night (Saturday)! If I can make it through the next 12 hours sans fever, I will be released Monday afternoon. Monday marks 30 days since I was admitted and brings my total time spent inpatient since mid-August up to 95 days. There have been no real strides made and the doctors have reiterated that I will be back. But we’re trying to make the most of the good days I have and want to celebrate them out of the hospital as much as possible. Thank you for your continued support, prayers, and love. Like most across this country, I spent my time this past long weekend focused on the multitude of blessings in my life. These marathon hospital stays are survived only through the kindness of the people in my life. It is difficult to know how to appropriately thank you all for what you have done for us. You have inspired and humbled me. I am incredibly thankful that my body has protected my mind against the effects of the recent medical hell and prevented me from remembering a large portion of the worst. I am thankful that the parts that I remember are mostly filled with good and love and family and friends. And I am thankful that my family and friends fill me in on all the life that I miss while incoherent. Thank you to the family members who leave messages and send numerous texts of love. Just pure love. Thank you so much for all the cards we have received. Your words fill us with warmth and remind us how much we’re loved. Thank you to all my younger friends who work endlessly on the artwork that adorns my hospital walls. Thank you for the e-mailed iPad drawings and the goodnight videos. Thank you for my school pictures and the drawings which constitute my wallpaper. I get questions and admiration all day. And each little glance from the corner of my eye brings a smile to my face. Thank you to all our visitors. Despite the fact that I sleep through roughly 2/3 of all visits, you keep coming back. You bring your joy, your stories of the outside world, your smiles, and your laughter. All those good things that help to ensure that the medicine used inside the hospital will actually be effective. Thank you for playing the latest strategy games with us for hours on end. Until security reminds us that we are, in fact, in a hospital. Thank you for spending your lunch hour with me. For stopping in after your own appointments in the area. For bringing me fuzzy socks and solitaire games. Thank you for talking about the latest movies and the book you read last month. Thank you for reminding me that life goes on. Thank you to the family and friends that help to remind us that time is still passing while we’re still impatiently inpatient. Seasons change and holidays still happen. But thank you for making sure we’re still a part of the passage of time. Thank you to my mom who helped us decorate pumpkins and my room for Halloween. Just days after I had pulled a Halloween stunt that nearly took my life. Thank you to my mito sisters for spreading out the Thanksgiving love and for being thankful with us for three consecutive days. Thank you to the Bush/Dalton/Mahoney household (aka our “Massachusetts family”) for allowing me and Keith to stay for the four days between major hospitalizations. Thank you for sharing the giggles and smiles of my dear little munchkins. Thank you for the love and the tears. Thank you for being our family when our family is so far away. Thank you Sarah for braiding my hair while I was in the MICU and bringing some beauty to White 9 with your Physics equations all over the white boards. Thank you Liz for crossing multiple state lines to bring some holiday cheer and sending me balloons to keep me company when you are unable. Thank you Stef for holding my hand through it all – even while I hated you deeply as the 108.6 fever made me the most obstinate human being in existence. We are so moved by the actions of our loved ones. But some of the most moving blessings have come from people I hardly know – or don’t even know at all. From people I have only met in passing. Or from people who know of me solely through common friends or family members. Over the summer, Keith and I travelled 5 hours to upstate New York to attend the Mighty Matthew Benefit. Matthew and I gathered quite an audience of his school friends and we fielded questions about mitochondrial disease and life with our “tubies.” Matthew told one of these friends that I was very sick and in the hospital for a long time. When Matthew came to visit again, he brought with him a get well letter from his friend included with a school photo. It brings tears to my eyes to know that Matthew is so well connected with so many kind and genuine children in his youth. And to know that those 45 minutes resonated with this child and his life was changed by learning more about mitochondrial disease. Thank you to this young man for your kindness and concern. And a huge thank you to his parents for raising such a proper and considerate young gentleman. It’s so reassuring and touching to that see children like Nate are in this world, making it a better place. About ten years ago, a young girl named Brittany contacted me. She was a good friend of my very close cousin and had recently been diagnosed with chronic fatigue syndrome. As I was dealing with my own chronic medical issues, my cousin passed on my contact information, and Brittany and I helped each other through a particularly difficult time in both of our respective lives. It helped both of us to have another young girl dealing with health issues. Although we lost contact over the next few years, my cousin contacted me to let me know that Brittany had lost her life in a car accident. Her death radiated throughout her community. I am reminded yearly of the love she left in this world as my cousin’s family participates in an annual run in her honor. This year, I felt her love even closer as her uncle, Geb B., completed his first Iron Man competition with my name written next to Brittany’s on his sleeve. I feel so honored and loved to have a place next to Brittany’s. Thank you. My mom has made the 3000-mile trek from her home in California to our Boston-based hospital twice since September. The second time she came she noticed that I bring my own pillowcases from home during each stay. A combination of allergies and homesickness inspired this tradition. In order to keep my sanity, I make sure that my pillowcases are the most vibrant and happy ones that I can find. Shortly after that visit, my mom put a call out to the long list of family and friends who have been following our story and this Thanksgiving, we celebrated with the blessings of nearly two dozen different families who sent the most vibrant and unique pillowcases that they could find. 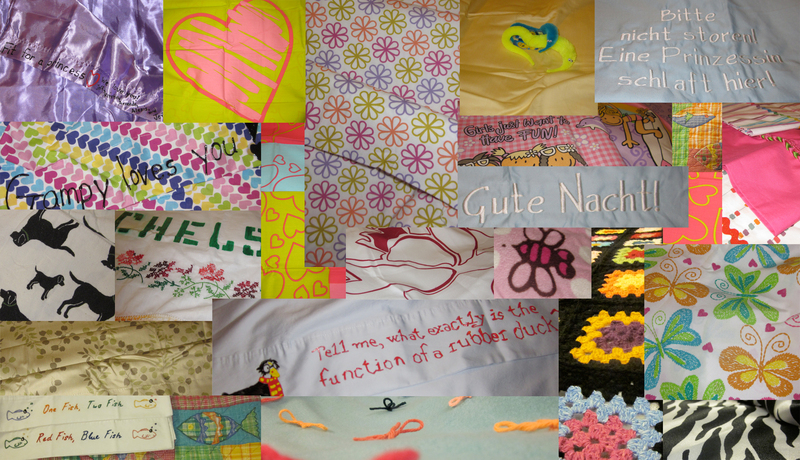 In addition, my aunt sent a beautiful ribbon quilt and a family friend crocheted a bright and happy blanket. I just don’t know if I can say it enough. Thank you. Thank you to everyone. You are all so amazing. Thank you, thank you, thank you. To those who have called. To those who have visited. To those who have sent letters, e-mails, and care-packages. To those who have sent their prayers and positive thoughts. To those who have placed us on prayer lists. To those who have spread my story and the need for awareness about mitochondrial disease. To all those who have shown such compassion and care. Thank YOU. Chelsea….Thank YOU for being the amazing, radiant, inspirational, courageous, and loving woman that you are. You have taught us all what it is to love, to give, to believe, to fight…..
You are a blessing in our lives and the children adore you. We all do. You ARE family to us and give thanks for that every day. You are 1 of the most amazing people i have ever met! You been though so much I can’t even imagine! You aways amaze me. Your mito sis Rachael!